Do baby back ribs the way BBQ pros do. 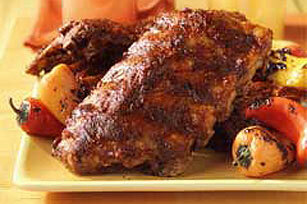 First a rub, then a slow cook with a couple brushings of a tantalizing, tangy sauce. Grill on covered grill 45 min. to 1 hour or until ribs are done. Remove ribs from foil; discard foil. Return ribs to grill; brush with 1/4 cup marinade. Grill 15 min., turning and brushing occasionally with remaining marinade. For enhanced smoke flavor, use aromatic wood chips -- hickory, mesquite or others soaked in water. Add to the grill right before the food goes on the grill for best results.